Just imagine driving along the freeway on your way to work only to spy something rather unique (to say the least) out of the corner of your eye. Peering over buildings around Cincinnati is an interesting creature not native to rooftops. Your first pass would beg the question, "What was that?" On your way home from work, you'd be sure to take a hard second look – only to find it was a Komodo dragon of the inflatable variety. This character inflatable is half beast, half inflatable advertising balloon and all about piquing curiosity. And it did just that during a seven-week publicity tour throughout the city. According to Chad Yelton, Director of Marketing and PR at the Cincinnati Zoo & Botanical Gardens, "We identified seven key locations along major interstates in the Cincinnati area. Our goal was to use the [character] inflatable to create conversation through viral marketing. 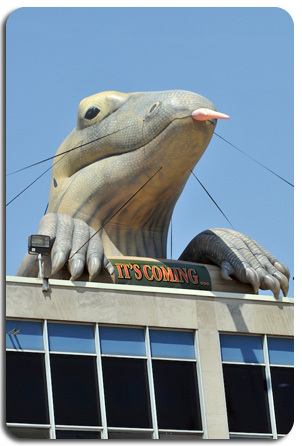 The banner on the inflatable reads, 'It’s Coming.' We wanted people in Cincinnati to start asking the question, 'What’s coming?' Our new exhibit, Dragons! opened June 5th." With inflatable advertising that's practically as interesting as the exhibit itself, you can't help but capture the attention of passersby.